I put up a post a few days ago about working with triads of colour. I said I was looking forward to trying out the principles with acrylic paint to see what that might be like and it’s been great fun. 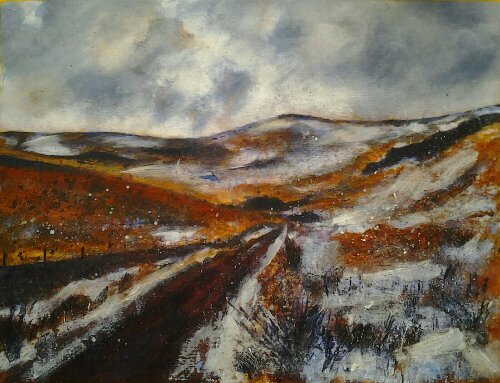 I have found painting the landscape in the Peak District to be an interesting challenge. Moorland can be pretty bleak and uncompromising and although this is contrasted with some lovely rolling green hills interspersed with rocks, trees, and dry stone walls, the composition and use of colour becomes more important, otherwise I find I can end up with a just a very green painting. 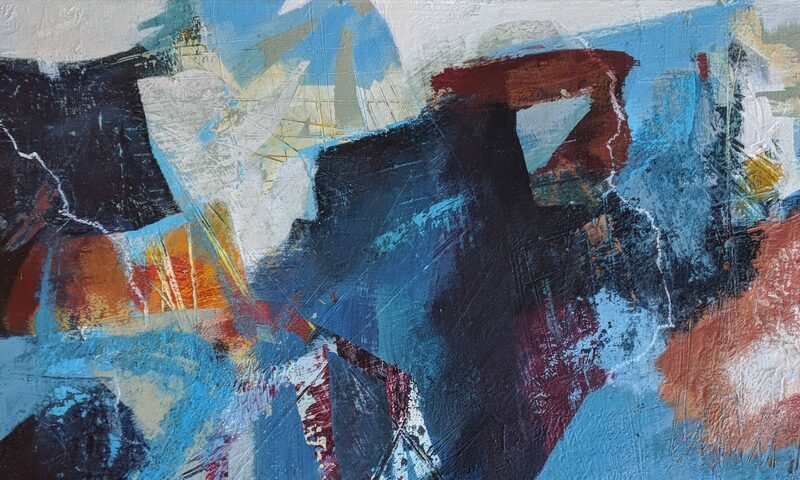 I think this is one of those times when, because I’m not painting something that is particularly beautiful of itself, unlike the Isles of Scilly for example, it can become beautiful through the expression of the artist. There is a wildness and bleakness that I do find appealing and compelling, but that doesn’t make it something that in my view works as a painting, so the challenge is how convey something of the bleakness and the wild openness in a way that is visually attractive. The chance to play around with some colour seemed to fit well with this, and here are my first couple of attempts. 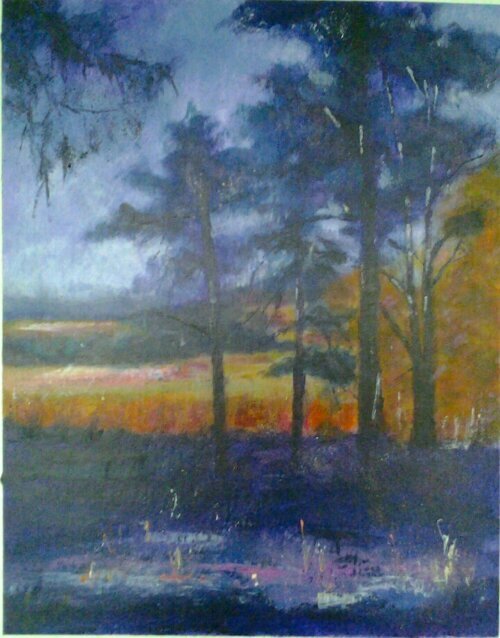 The first painting is of scotch pines in the grounds up at Longshaw. This was from a walk on a lovely bright winter’s day. I was particularly struck by the deep shadows in the foreground and the light in the distance. The walk we did on this day took us through Grindleford and Padley Gorge where I took lots more snaps to work on back in the studio. Longshaw is a National Trust property between Sheffield and Hathersage. 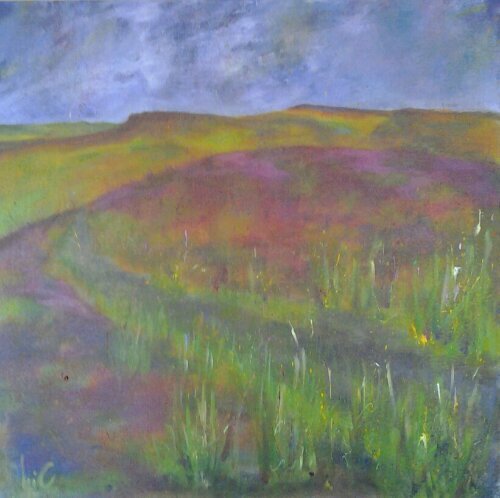 The next couple of paintings are both around Stanage, one of the many grit stone edges that can be found in this area. From the tops the moors stretch out before you into the far distance and all there is to see is mile after mile of rolling heather, bracken and grass moving in the breeze. Here’s something from a day with the heather in bloom and another when there was snow on the ground. Previous PostPrevious Derbyshire Open Arts. Next PostNext The sea – my first love?